I've been trying to assimilate the new toys into the house so that I'm not stepping on it (duplo/lego), pushing it out of the way of an almost 2 year old (playmobil) or finding it stuck to me (mosaic jewels). The days have been cold and crisp. We stayed at home yesterday not leaving the house. The roads hadn't been gritted and I couldn't face slip sliding with BigR and a buggy! e didn't need to go out. It was cosy. We made loom band bracelets whilst LittleR napped. The girls played without too much refereeing. I didn't even have to rely on my faithful cbeebies baby sitter. Today we went out and did a few little errands. It was such a lovely day but it did take more than 15 minutes to de-ice the car. Tomorrow we go to collect the ABO and then we start our holiday. I've got an extra week off after BigR goes back to school. We're planning some nice days but I think we'll end up doing some house maintenance stuff too. So it's likely to be a little bit quiet around here over the next couple of weeks. Then LittleR is 2. Time really does fly. Especially when you're having fun. Thanks for visiting my blog in 2014. Wishing everyone health and happiness in 2015. 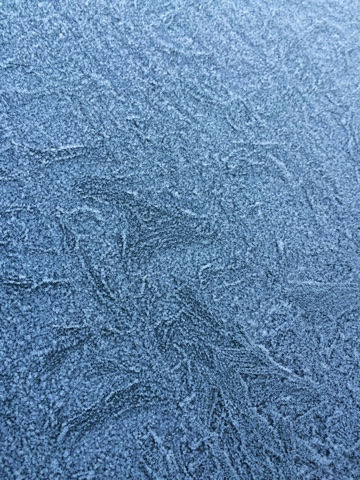 Doesn't the frost make the most beautiful patterns. Much of the same going on here. I do have to venture out to get some groceries tomorrow though. We're having my parents in law for dinner on New Year's Day so need to stock up. Hope it's not too frosty. Glad I'm not the only one who employs that particular babysitter! Happy New Year's wishes to you! Happy belated New Year to you and your family. Quiet family time. Can't beat it.